The town of Sozopol in Bulgaria has also got its own unique, interesting atmosphere, similar to Nessebar. Albeit there are no buildings and churches left from the ancient and medieval times, we can still find exciting historical buildings from the 18th and 19th century, and we can spend our days on two beautiful sandy beaches. The seafront surrounded by cliffs provides an astonishing view, especially when viewed from one of the restaurants built on clifftops. You are not allowed to drive into the city centre of Sozopol; you may leave your car in one of the secure car parks provided. The history of Sozopol dates back to as far as the ancient Greek times. Greek settlers arrived here in around 600 BC with the intention of founding a polis (city-state) on the site. According to ancient Greek mythology, the name of the polis was Apollonia, named after Apollon, the God of Music and Poetry. During the times, the city which is now Sozopol was destroyed in multiple occasions. This was done first by the Romans in 72 BC, then in 1453 the Turkish hordes did the same, especially focusing on destroying all the medieval churches. The Isle of St John is nearby, where a monastery was built in the medieval ages, but this got also destroyed by the Turks. You may still see its ruins, along with the lighthouse on the island; just go to the port and catch a water taxi to get there. The city of Sozopol is full of patisseries and street vendors selling Bulgarian ice cream. Bulgarian ice cream is very delicious and is served in huge portions. The cones are twice as big as what you may be used to, and scooped with a wooden spatula, and priced by its weight, not by the number of scoops. The prices are quoted per 100g, and if you are unfamiliar with the measures, you might end up having and paying for half kilo of ice cream, which you will struggle to consume. Whether you enjoy huge portions of ice cream or not, Balkan Holidays have fantastic offers for you to spend your summer holiday to Bulgaria in Sozopol. The best offer for a 5 star accommodation in Sozopol starts at £356 with return flights and transfer included, so why not treat yourself with some affordable luxury on the southern Black Sea coast? 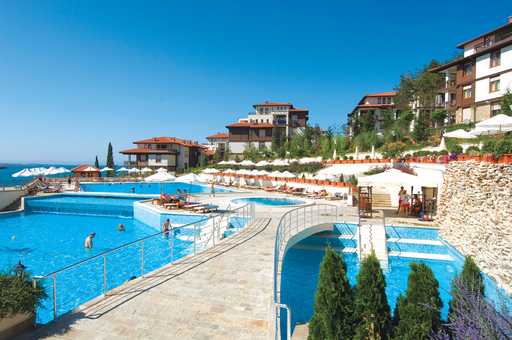 Click here to find out more about summer holidays in Sozopol.